Cutting: A simple wine with tart cherry, herbal and vanilla characteristics. The Sebastian Zinfandel from Sonoma County is a simple, but enjoyable wine with black cherry, herbal and vanilla aromas. On the palate, tart cherry, herbal, vanilla, spice and berry flavors come through. 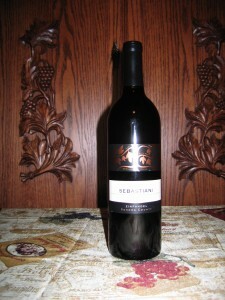 This wine received the most varied ratings of wines in the tasting ranking from first to last. Our senior Zinfanatic ranked it last. This should appeal to those who like simple wines with tart fruit flavors.